Considerably livelier and more developed than its neighbouring sister island of Tobago, Trinidad offers a unique Caribbean ambience combining natural beauty and gorgeous beaches, with a busy, modern city and cruise ship harbour. Trinidad is said to be where Calypso music was born, along with 'limbo' dancing and steel drums, and the island's thriving Caribbean culture is especially present at its legendary February carnival celebrations. 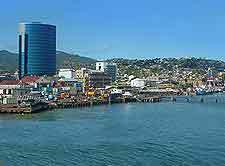 The Port of Spain serves as the capital of Trinidad and is very much a major part of island life, containing sights such as the historical St. James Barracks and Woodford Square, although tourism and commerce are especially notable at the resorts of Arima, Chaguanas, Pointe-a-Pierre, Point Fortin, Point Lisas, San Fernando, Sangre Grande and Siparia. Most of these resorts feature their very own tourist information centres, as well as shops and restaurants specialising in traditional Creole cuisine. 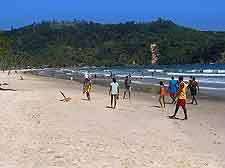 Although for many a tourist, it is the beaches and sunny tropical weather that are the main reasons to pay a visit to Trinidad, there really is much more to the island than just sun, sea and sand. Trinidad is home to literally hundreds of wild orchids and exotic birds, and the island's rich flora and fauna is especially noticeable at the Asa Wright Nature Centre, in the Arima Valley. Families will enjoy spending a few hours at Port of Spain's popular Emperor Valley Zoo, while for others, it is the allure of the city of San Fernando that is hard to resist, where its tall Anaparima hill boasts views as far as Venezuela. 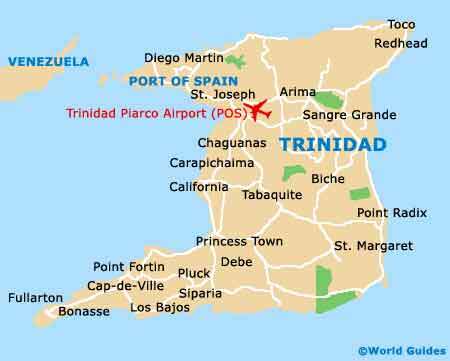 More information about Trinidad Tourist Attractions. San Fernando is also where you will find the acclaimed modernist Carnegie Free Library and a number of further prominent structures. However, most of the main man-made landmarks on Trinidad do reside within Port of Spain, such as the Archbishop's House, the Brian Lara Promenade, the Cathedral of the Immaculate Conception, the Holy Trinity Cathedral, Fort George and the Hall of Justice. Port of Spain is also where you will find the President's House, which has long been the official residence of none other than the President of the Republic of Trinidad and Tobago, and is located alongside the island's glorious Botanical Gardens. More information about Trinidad Landmarks and Monuments. Most would not choose to holiday on Trinidad for its museums, although you won't have to look hard to find some good offerings, particularly at Port of Spain. With detailed information about the island's geology, wildlife and festivals, the National Museum and Art Gallery is one to look out for and stands opposite the Memorial Park. Nearby, the Chaguaramas Military History and Aviation Museum may also be of interest. Just a short distance to the east and within the town of Arima, Trinidad's popular NGC National Science Centre (NSC) also warrants a mention. More information about Trinidad Museums. 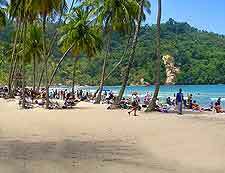 Tourists who have the time to enjoy some island hopping during their Trinidad vacation would regret not catching one of the daily ferries to the neighbouring island of Tobago, which is just 30 km / 19 miles to the north-east. 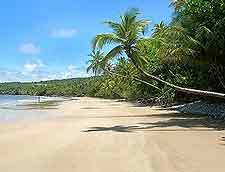 Trinidad is also very close to the Bocas Islands (Chacachacare, Gasparee, Huevos and Monos) and the Five Islands, with regular cruises connecting these tranquil destinations. A little further afield and connected by both ferry and plane are the islands of Barbados, Granada, St. Lucia, and also St. Vincent and the Grenadines. 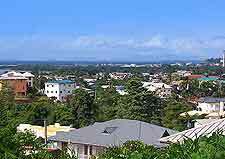 More information about Trinidad Attractions Nearby.